Even though we started the holidays a bit early this year with Christmas tree cupcakes, gummy bear cookies, and my current wrapping obsession – now it is definitely holiday season. 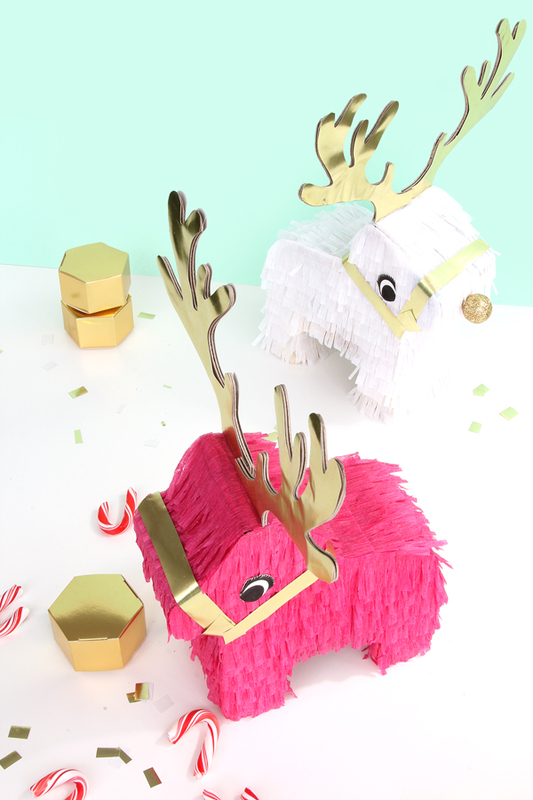 I’m jumping right in with these fun reindeer pinatas. 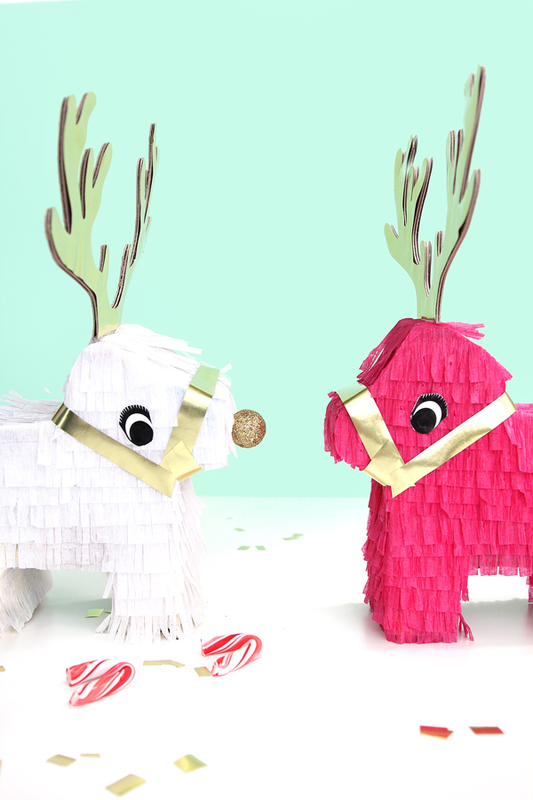 A similar concept to the unicorn pinatas, except reindeers! Because reindeers are the magical creatures I am loving this month. This pinata update is a fun twist on the affordable mini-donkey pinata base. I love that our reindeers are pink and gold – I mean if they really are magical, who says they have to be brown? Brown has never seemed very magical to me. But pink and gold with a glittery nose… for sure! Take a cue from this holiday transformation and create a winter party scene that is bright + fun. 1. Start by tearing all of the fringe off of the donkey pinata. Save the eyes because you will be putting those back on later. 2. 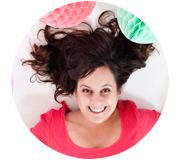 Using your fringe scissors and the crepe paper, cut enough fringe to cover the whole pinata. Hot glue the fringe onto the pinata. 3. Once it is completely covered, put the eyes back in place. With the gold tissue paper, cut out long rectangular strips for reigns and glue those around the reindeer head. 4. 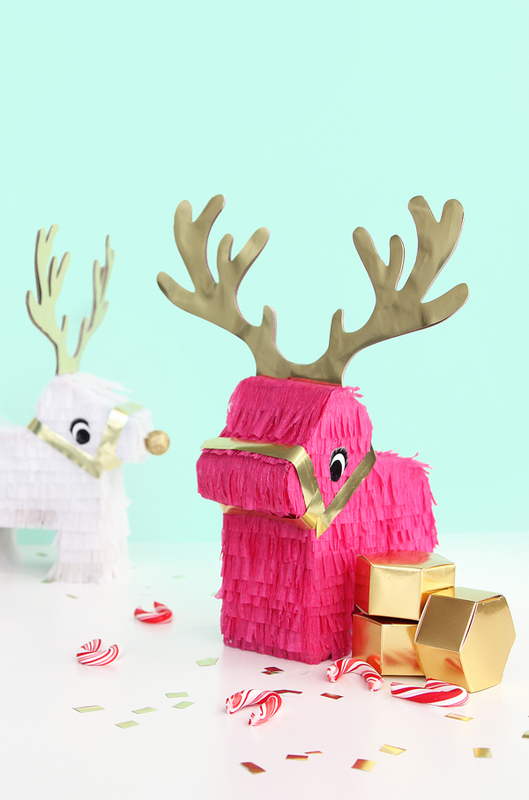 With the cardboard, cut out two antlers for each pinata and cover them in the gold tissue paper. Hot glue them to the top of the reindeer heads. 5. 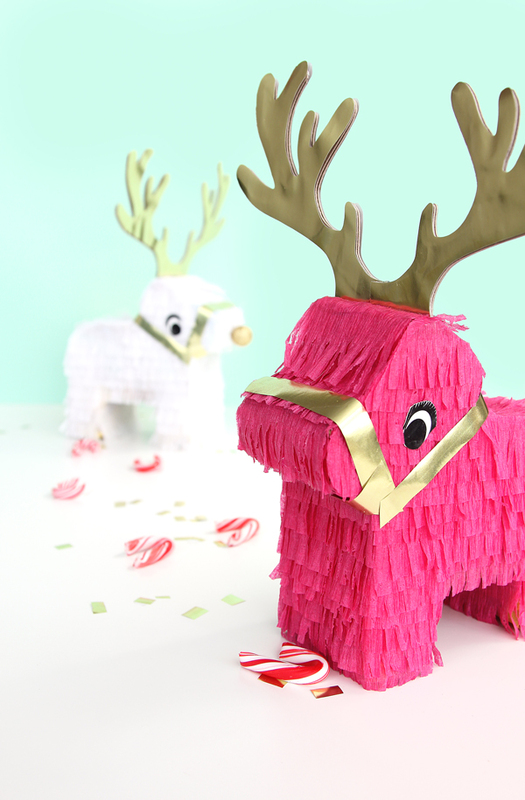 Glue on a pom pom for a nose, and you’ve got yourself a reindeer pinata! If these guys are driving the sleigh, I am sure that the presents left behind will be the most awesome. (Styling and photography ©A Subtle Revelry by Sam Ushiro). These are adorable! So cute; love them!